By 2020, Cisco forecasts that 5.5 billion people will own mobile phones. In the United Kingdom alone, tens of millions of these mobile users will each consume 20 GB of data per month and use more than 25 different smart devices in their daily routines. Factor in data-hungry applications like 4K video, driverless vehicles, smart factories, and broadband access expanding to the most rural places on Earth, and it’s no surprise that today’s wireless networks cannot handle the rapidly approaching, hyper-connected future. To address the unprecedented demand for increased data rates, expanded network capacity, and improved reliability, engineers and researchers at the University of Bristol and Lund University are using the NI Multiple Input, Multiple Output (MIMO) Prototyping System to rapidly innovate and advance 5G cellular networks to transform the future of wireless communications through massive MIMO techniques. The team has successfully demonstrated greater than 20X increases in bandwidth efficiency compared to current 4G cellular technologies, which opens up new, record-setting realms of possibility for 5G deployment sub-6 GHz bands. Unlocking the potential of 5G networks starts with understanding the benefits of massive MIMO. Massive MIMO uses large numbers of antennas (more than 64) at a base station to spatially multiplex. This means we can serve more users in a dense area without consuming any more radio spectrum or causing interference. In other words, massive MIMO means fewer dropped calls, a significant decrease in dead zones, and better quality data transmission, all without stretching the limits of our increasingly scarce radio spectrum. Better still, massive MIMO promises to reduce costs and improve energy efficiency compared with current LTE (4G) networks, while providing reliability improvements through redundancy from the increased number of antennas. The team from Bristol and Lund set out to test the feasibility of massive MIMO as a viable technology for bringing greater than 10X capacity gains to future 5G networks. They turned to NI for an extensible MIMO prototyping platform with flexible software defined radio hardware and open reconfigurable LabVIEW software backed by the expertise of the Advanced Wireless Research Group at NI. 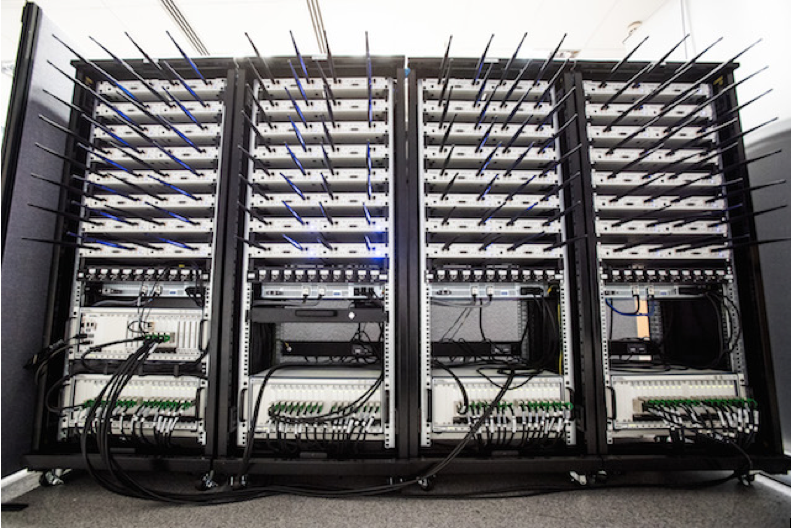 Using the NI MIMO Prototyping System, the team could focus on applying the theoretical principles of massive MIMO under real-world conditions and rapidly test new ideas on their way to implementing the world’s first live demonstration of a 128-antenna, real-time massive MIMO testbed. Using this cutting-edge testbed, the team set two consecutive world records in spectral efficiency. They achieved over 79 b/s/Hz of spectral efficiency over a 20 MHz bandwidth, fully bidirectional, real-time, over-the-air link at 3.5 GHz with 12 simultaneous users. Shortly after, the team extended the system to achieve over 145 b/s/Hz of spectral efficiency by increasing the number of users to 22 sharing the same time-frequency resource. The NI MIMO Prototyping System is a combination of NI commercial off-the-shelf hardware paired with LabVIEW software. The platform acts as a solid foundation for the high-throughput, high-capacity, low-latency system. The team integrated nearly 100 different pieces of hardware, yet seamlessly developed the entire application within a single software framework. This modular approach, tight software/hardware integration, and built-in real-time FPGA IP in LabVIEW gave the team the solution it needed more quickly than anticipated and ensured that future changes to the platform would be cost and time effective. In a joint venture between the University of Bristol and the Bristol City Council called Bristol is Open, the Bristol team plans to deploy its massive MIMO testbed on a rooftop within the city limits and connect to its fibre-optic network; thus, opening up the ability to conduct further research into the real-world impact of this technology on society. Eventually, Bristol will split the system into four, 32-antenna subsystems, utilising the fibre network to implement a distributed massive MIMO configuration. Ultimately, this empowers network operators to establish better methods of communication for us all. Lund University will soon perform measurements concentrating on outdoor scenarios, channel characterisation, and accelerator IP design under more realistic deployment conditions on its very own NI massive MIMO testbed. Furthermore, Bristol and Lund will continue to collaborate on upcoming activities. Lund will host the Bristol team to conduct outdoor measurement trials with mobile users to further investigate the influence of mobility on massive MIMO. The Communication Systems & Networks (CSN) Group at the University of Bristol formed in 1985 to address the research demands of the fixed and wireless communications sectors. It combines fundamental academic research with a strong level of industrial application. The group has well-equipped laboratories with state-of-the-art test and measurement equipment and first-class computational facilities. Lund University seeks to be a world-class university that works to understand, explain, and improve our world and the human condition. The Electrical Engineering and Information Technology Department (EIT) at Lund University covers a wide range of research areas in the fields of analog and digital as well as communications system design and has been at the forefront of massive MIMO (MaMi) research including MaMi theory, channel measurements and characterization, and accelerator IP design.